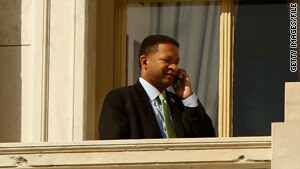 Rep. Artur Davis lost Alabama's Democratic gubernatorial primary to Agriculture Commissioner Ron Sparks. (CNN) -- Voters in New Mexico made history, while voters in Alabama did not. And a second party-switching lawmaker was ousted in a primary by his new party. Susana Martinez on Tuesday easily captured the Republican gubernatorial primary in New Mexico. She'll face off in the general election against Lt. Gov. Diane Denish, who was unopposed for the Democratic nomination. The winner in November will become New Mexico's first female governor, succeeding term-limited Democratic Gov. Bill Richardson. With nearly all the results reported, Martinez was winning just over 50 percent of the vote in a five-person primary field. The district attorney for Dona Ana County in the southern part of the state will join GOP Lt. Gov. nominee John Sanchez on an all Hispanic ticket. Assistance from the Republican Governors Association apparently played a key role in the Martinez victory, and an endorsement and campaign visit last month from former Alaska Gov. Sarah Palin also aided Martinez. "New Mexico citizens are ready to end eight years of broken government under the Richardson-Denish Administration. Susana Martinez is poised to bring a new era of responsibility to Santa Fe," RGA spokesman Tim Murtaugh said in a statement. "Susana Martinez is all flash and no substance. She was an ineffective District Attorney and doesn't deserve a promotion to the state's top job," Democratic Governors Association Executive Director Nathan Daschle said in a statement. "We've all seen too many politicians who promise the world, deliver very little and then expect a promotion. New Mexicans want a Governor who will get the job done. That's Diane Denish." In Alabama, Rep. Artur Davis failed to become the state's first African-American Democratic nominee for governor when he lost the primary to Agriculture Commissioner Ron Sparks. With 99 percent of the precincts reporting, Sparks captured 62 percent of the vote to Davis' 38 percent. "Davis' vote against President Obama's efforts on health care reform and his lack of support from statewide black leaders, helped lead to his defeat Tuesday night," said CNN Political Editor Mark Preston. If Davis had won the primary and then the general election, he would have become Alabama's first black governor. The Republican gubernatorial nomination is headed for a runoff. Former state community college system chancellor Bradley Byrne will be in that runoff after capturing 28 percent of the vote Tuesday. The second spot is too close to call, with Tuscaloosa physician Robert Bently leading Greenville real estate developer Tim James by 140 votes. James, son of two-term Gov. Fob James, created a buzz in recent weeks with his tough ads and speeches against illegal immigrants. Former Alabama Supreme Court Justice Roy Moore, best known for losing his seat on the court for refusing to remove a statue of the Ten Commandments from his courthouse, finished fourth in the seven candidate field with 19 percent of the vote. In another high profile race capturing national attention, Rep. Parker Griffith was ousted in his bid for a second term. Griffith, who made headlines late last year when he changed his party affiliation from Democrat to Republican, came in second with only a third of the vote. Madison County Commissioner Mo Brooks grabbed just over 50 percent of the vote in the battle for the GOP nomination in Alabama's 5th Congressional district, located in the northern part of the state. "Griffith is the fourth incumbent to lose his bid for re-election this year, yet further evidence that voters are willing to dismiss Washington experience for fresh blood on Capitol Hill," said Preston. "And we have seen another example of a party switching politician being shunned by primary voters." Last month, Pennsylvania Sen. Arlen Specter, who abandoned the Republican Party in 2009, lost in the Democratic primary to Rep. Joe Sestak. In other Alabama news, Sen. Richard Shelby easily won the GOP primary in his bid this year for a fifth term. In Mississippi, Angela McGlowan failed in her bid to become the first black Republican member of the House since J.C. Watts. The conservative political strategist and Fox News analyst had been courting Tea Party activists. She came in a distant third in a three-person field. Longtime state Sen. Alan Nunnelee won just over 50 percent of the primary vote and will now face Rep. Travis Childers, a conservative Democrat who's held the seat for two years, in November.